The shop will aim to provide a full range of groceries at affordable prices, local produce and crafts, postal services and a café meaning that residents will no longer have to travel to Petworth and Pulborough to buy their essential grocery items. It is hoped that the new shop and café will reduce social isolation in the village and provide a platform for future community outreach services. "This is a much-needed development for the residents of Fittleworth," says Councillor Eileen Lintill, Cabinet Member for Community Services at Chichester District Council. "This will provide them with more than just a place to buy groceries; it will create jobs in the area, help tackle social isolation, and become a hub for the community." The preferred location for the shop and café is on land that is already owned by the parish, at the heart of the village. This means it will be within walking distance for the majority of village residents while also being close to the school, recreation ground, and the village hall. The existing play area will be replaced and relocated adjacent to the new community shop and café. The climbing wall will be moved to the nearby school play area and two pieces of outdoor gym equipment will be relocated to a more suitable area within the recreation ground. The new play area will cater for a wide age range of children and feature sustainably sourced wooden equipment designed to reflect the rural area with farmyard and nature themes. The play area will be fully accessible for wheelchair and pushchair users and will encourage physical activity and social interaction among children and their parents and carers. 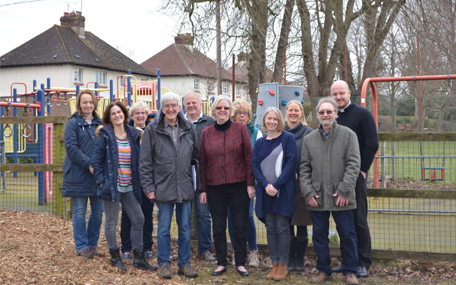 It is hoped that the play area will not only attract residents in Fittleworth, but will also draw in visitors from the surrounding villages and hamlets that lack any play facilities of their own. This will help drive customers to the new shop and café, supporting sales and ensuring the village remains a thriving and cohesive community for years to come. Alison Welterveden, Chair of Fittleworth Community Shop Ltd, says "We have been greatly encouraged by the success stories of other community shops throughout Sussex and hope that in turn we might inspire others to take on their own projects. Our community shop, new playground and youth area will create a real focal point for our village - a new village hub and a place to be used and enjoyed by many different age groups. We have been staggered by the way in which our community rose to the challenge of raising the funding we needed for the project and are hugely grateful to all those who have shared our vision, including grant funders such as Chichester District Council, without whom the project would not be able to happen." The building work for the shop and café is expected to start this spring, with the anticipated opening in October 2018. The shop and café will then be open 8.30am-5.30pm Monday to Friday, 9.00am-5.00pm on Saturday and 9.30am-12.30pm on Sunday.